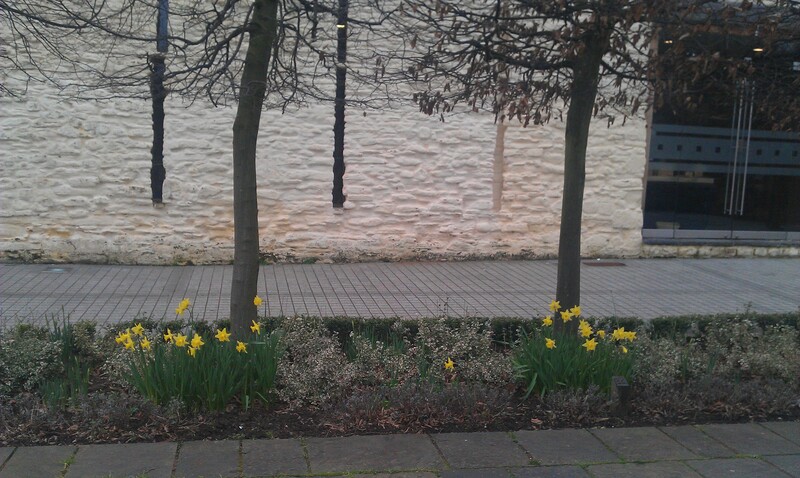 St Davids Day Holy Eucharist at 8am in the Herbert Chapel. On the Evening of St Davids Day the Bishop of Monmouth will preach at Jesus College, Oxford. The first Principle of Jesus College, Dr David Lewis is buried in St Mary’s Priory in the chapel which bears his name. The Bishops sermon will appear here shortly. As work on the St Mary’s Priory Tower comes to a completion the scaffolding is starting to go down. Meanwhile going back up on top – after its re-gilding – is the Cockerel weather vein. We are pleased to have the status of a Fairtrade Church and will mark Fairtrade Fortnight with a Sermon, by the Vicar, at the 9.30AM Family Service on Sunday March 4th. We will also be supporting the Abergavenny Faitrade Forums’ social event at the Methodist Church Hall, Castle Street on Tuesday, February 28th. Fair trade aims to help producers in developing or third world countries to make better trading conditions and promotes sustainability. The movement advocates the payment of a higher price to exporters as well as higher social and environmental standards. It focuses in particular on exports from developing( third world) countries to developed (first world)countries most notably handicrafts,cocoa, coffee, sugar, tea, honey, cotton, wine, fresh fruit and bananas, chocolate, flowers and gold. At St Mary’s Priory we only use Fairtrade products at our events and encourage our parishioners to do likewise in their homes. Fr Mark’s reflection on Chaplaincy. At Sunday Evensong in Lent we are looking at Chaplaincy – and its role in the mission and ministry of the church. Fr Mark was a University Chaplain and is a member of the Royal Army Chaplains Department, he gives an introduction to the series. PASTOR: Relationships are the rock on which chaplaincy is based. The Chaplain needs to be seen around, I have heard this referred to as ” loitering with intent, but not being a Christian stalker”. The roving nature of chaplaincy makes one more accessible- if you have a problem it is easier to arise is with some one in passing than it is tp pick up the ‘phone or call at the office. PROPHET: Being the voice of the voiceless is the least obvious, but never-the less an important role of the Padre, as is being the moral conscious of the institution. PRIEST: The people you Chaplain see you as their ‘vicar’ so they come to you to marry them, baptise them or their children. I have contacted more Funerals of young people, than I would like to have over the past 4 years, some were killed in Afghanistan, others took their lives and a sizable number died naturally. The benefit of chaplains is three fold. The Young people ( be they students or squadies) have an independent person to whom they can turn- some one semi-detached from the institution. A studt by Francis & Robbins between 2006-10 showed that 27% of those questioned had considered taking their own lives. Young people have it tough today! It is good if they feel there is some one there batting for them. The Church would not come in to contact with many of these youngest if it waited for them to come to church. Yet statistics show that ” churchgoers were more likely to feel they had a purpose in life than other young people”. The Institution, be it an arm of the forces or a Higher Education institution benefits from improved moral and greater retention. The British Army has long valued the role of the Chaplain in developing morals be it by Padres Hours or MAT6 or IDT11. This is about making youngsters good citizens. During Lent this year, the sermons at Evensong at St Mary’s will be held together by the common theme of the presence of the Church in the ‘world’ in the form of chaplaincy (or ‘sector ministry’, as it is also known). The hope is, as Fr Mark said in his February article, that we may gain a better insight into the value of this particular form of ministry to the Church and the institutions served by chaplains. Fr Mark has asked me to write briefly on my own experience of chaplaincy, which is not as chaplain but of chaplains’ ministry during my time in the army. Some of you will know that, joining straight after leaving school, I was an officer in the German Army Military Police from 1987 to 2001 (retiring as Captain and Company Commander of a Staff & Support Company to go to Theological College in Mirfield in June 2001). During these years, I had eight major postings requiring me to move from one place to the other (not counting training courses of up to sixth months). That, and the nature of my work – a way of life more than a ‘job’, of course – meant that my ‘world’ was very different to that of most of my fellow Christians, some of whom on occasion viewed it as something ‘not quite right for a Christian’. The net result of all this was that I was hardly ever anywhere for long enough to build lasting friendships with members of local church congregations, nor found them necessarily aware or understanding of the challenges of my ‘way of life’. Please note None has moved forward to 14.15 to allow for a Funeral Service and Vespers will be sung at 17.10. New website to be launched soon! The project to redesign the new website for St Mary’s Priory is almost complete and we are looking forward its launch at the end of the month. The website, designed by local web designers David and Angela Siddall, will be much easier to navigate. It will be a dynamic site with links to blogs for thePriory Church, Tithe Barn and Priory Centre which can be regularly updated by the Church community and also include live Twitter feeds. Menus for the Tithe Barn Foodhall and catering in the Priory Centre, including Wedding receptions, will be available to download as well as information and booking forms for school visits offered by Learning Service. Tithe Barn manager, Richard Morgan, says “it has been a pleasure working with David and Angela throughout the project. From the outset they have understood the sense of community which is at the heart of St Mary’s Priory and have translated this into a very user-friendly website. We already have a number of followers for our blogs and interaction with Twitter users across the world and we hope to increase this when the website is launched at the end of the month. The launch of the website will be announced via Twitter.